Acting irrationally, Captain Kirk takes the Enterprise into the neutral zone to be captured by the Romulans in order to steal a cloaking device. The Enterprise Incident was first broadcast September 27, 1968 and repeated December 27, 1968. It is episode #57, production #59, written by D.C. Fontana and directed by John Meredyth Lucas. This episode's not bad at all, but third season TOS episodes tend to be either delightfully bad or kind of strained somehow, like they didn't have quite enough story or money for a whole episode so everything is stretched a little too far. For me this one feels like one of the latter. Shatner does look really weird in the Romulan makeup . . . I think it's because every Vulcan and Romulan we've seen to this point has had a very sharp face, lots of cheekbones. I guess can concede that, roughly speaking, the actors chosen to play Vulcans and Romulans had more angular features in the main -- which may have been deliberate. This actually makes the plot more realistic, cuz it makes Kirk a fairly unconvincing Romulan upon inspection -- but probably adequate for the smash-and-grab mission he's on. An agent on a longer-term infiltration would need a better disguise, like Darned Arvin in "Tribbles". He also forgoes the bowl cut, which makes him look even less like a Romulan . . . But here we run into that familiar confusion between Star Trek, a teevy show that was on in the 1960s and "Star Trek", the vast universe of things named for it, but created much later. Kirk doesn't get a Spock hair-do to look like a Romulan because Star Trek did not establish that all Vulcans and Romulans wear the same haircut. None of the women in any of these eps have anything remotely similar to the 'do they gave Denise Crosby when they made her a Romulan in Next Gen**. In the current ep, we have three Romulan men on the bridge without helmets, including pivotal character sCmdr Tal. All three have curley hair -- nothing like Spock's. Mark Lenard and Jane Wyatt came to [Leonard Nimoy] for advice on Vulcan culture. Nimoy replied that he had come to believe Vulcans placed great importance on their hands and hand gestures, and suggested Lenard and Wyatt find a way to demonstrate that, when on screen. The actors then created the finger-touching gesture seen in the episode. So apparently Spock and Comander Rareandbeautiful were supposed to kiss, and Nimoy nixed this as un-Vulcan. In somewise then, we can thank General Urko and Mrs. Anderson for working out just what romantically inclined Vulcans / Romulans do to show affection, which had clear implications for this episode. * He appears to be shaven-headed, and wearing a stylized black hood. **Far more jarring, I thought, was that she was the first (AFAICR) Romulan or Vulcan of any kind to be portrayed as having fair hair. I Googled Sarek and the Romulan commander from Balance of Terror, because I was pretty sure Mark Lenard always had the Spock 'do. Looking at the screengrabs his hair is shorter than Nimoy's and sometimes it has a slight part, but generally I think we could call it a "Caesar" cut. I'll concede it's not the "full Spock" though. Did you have to Google up pictures for all of those, or did you work from memory? I watched Star Trek (and Twilight Zone and Outer Limits and Batman and Mission: Impossible and The Invaders and Time Tunnel and Lost In Space and Voyage to the Bottom of the Sea and Man From Uncle and The Prisoner and Super-car, and Fireball XL-5, and Stingray and . . . anything with a whiff of SF) when it was first broadcast. Formative years, and there was very little competition on either the small or the big screen in the 1960s for full-blown space opera. I retain vivid memories even of some of the "scenes from the next exciting episode". I participated in the letter-writing campaign to stop cancellation. I built the Enterprise and Klingon model kits. I voraciously read and reread The Making of Star Trek, Bjo's Concordance, David Gerrold's two books about the series, and James Blish's adaptations. When the show went into syndication in the 1970s, I stayed up late to watch Star Trek marathons, and watched whenever it was on. When, for while, the only station showing Star Trek was too far away to get any kind of picture but had usable sound, we watched the static anyway and I narrated the action for my siblings from memory. By the tenth anniversary of Star Trek, I'd probably already seen every episode a dozen times. Yes, I mostly worked from memory. To be honest, I couldn't recall what Sarek's assistants looked like at all and couldn't quite remember what the Vulcan enforcer had on top of his head, but Memory Alpha will provide. As for their facial appearance, maybe I overstated when I said every Vulcan or Romulan had that same sort of face. No, there I think you've made an accurate observation. For whatever reason, it's high cheekbones and pointy chins (relatively) all around on Vulcan and Romulus -- Kirk's rounder face and rounder physique makes him a poor choice for an undercover Romulan. Oh, I've watched TOS many, many times myself in reruns, about as far back as my memory goes. But even so, my memory doesn't hang on to details like those. You're not a fan of TNG or any of the Treks after that, right? Can I ask what the aversion is about, there? To me all of the Treks pre-Abrams are very much continuing from TOS and the movies with the original cast. They evolve in different ways and TOS and DS9, for instance, are very different shows, but they're all related. DS9 may be TOS's rebellious nephew or something, but they share blood. You're not a fan of TNG or any of the Treks after that, right? Can I ask what the aversion is about, there? I don't have an aversion so there's nothing for it to be about. All I've ever said is that a) I prefer the original and b) I disagree with the party line that the later series represent some kind of continuum with the original. Fans of these shows often make blanket statements about the "Star Trek Universe" or "Star Trek Franchise" (ick) that are possibly true for all the later series, but demonstrably untrue for Star Trek. This gets a little irritating. a) I watched the original, live in its original context -- US, 1960s -- and in syndication the 1970s when there were few alternatives. b) I was in my thirties when, after a gap of almost twenty years, Next Gen premiered. I'm never going to have the same perspective on it as someone who was in grade school at the time, or even college, and for whom the original was history. But I'm not unfamiliar with the later series. I watched 'em all up until part way through Voyager. I've seen maybe three eps of Enterprise. I have watched a handful of Next Gen eps twice, but none of the others. To me all of the Treks pre-Abrams are very much continuing from TOS and the movies with the original cast. The later series are all far more similar to each other than they are to the original. They had to be. There was a gap of nearly twenty years between the end of Star Trek and the beginning of Next Gen. They were all produced -- overlapping -- by the same team, an almost entirely different group of people to those who created the original. Most of what Roddenberry contributed to Next Gen consisted of obstacles to story telling (NextGen human society has been perfected; nobody can ever fight or experience jealously; the Federation doesn't use money; Wesley Crusher; Ferengies). The later series all share an atmosphere of earnestness, of unctiousness, that is very different from the original. In terms of SF alternatives, Star Trek was scarce and presented in a time of scarcity. 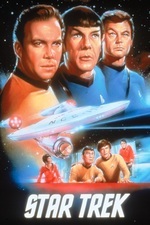 The later series were presented in a time of abundance; in fact, the overlapping productions created a glut of Trek-like product in the last decades of the 20th century. DS9 may be TOS's rebellious nephew or something, but they share blood. DS9 ended up being about a war. They had to wait for Roddenberry to die to make it so. The entire premise of the all-out War against the Changelings -- or the Borg for that matter -- goes against just about everything the original stood for. That universe simply would not have had those things in it. These shows are all fine on their own, but they are on their own. To me they are just as alien to the original Star Trek as are the risible reboots. No bloody 'A', 'B', 'C', or 'D', and no 'synthehol' for me.